by J.A. Longridge and C.H. Brooks. Introduction: This document is a report on, and summary of, a paper titled "On Submerging Telegraphic Cables", read at the Institution of Civil Engineers (London) on February 16, 1858, by Mr. J.A. Longridge, M. Inst. C.E., and Mr. C.H. Brooks. The report bears the signature of C. W. Field at the top of the first page. The full paper is largely mathematical so is not reproduced here, but it can be read in the Minutes of Proceedings of the ICE, Vol XVII. THE Paper read was "On Submerging Telegraphic Cables," by Mr. J. A. Longridge, M. Inst. C.E., and Mr. C. H. Brooks. The Authors desired their attempt to investigate the laws, to which the operation of submerging Telegraphic Cables were subject, to be considered only as a partial solution of an interesting and somewhat complicated problem. 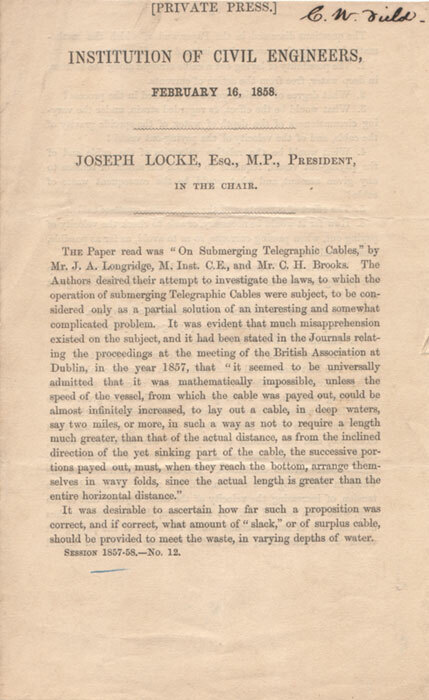 It was evident that much misapprehension existed on the subject, and it had been stated in the Journals relating the proceedings at the meeting of the British Association at Dublin, in the year 1857, that "it seemed to be universally admitted that it was mathematically impossible, unless the speed of the vessel, from which the cable was payed out, could be almost infinitely increased, to lay out a cable, in deep waters, say two miles, or more, in such a way as not to require a length much greater, than that of the actual distance, as from the inclined direction of the yet sinking part of the cable, the successive portions payed out, must, when they reach the bottom, arrange themselves in wavy folds, since the actual length is greater than the entire horizontal distance." It was desirable to ascertain how far such a proposition was correct, and if correct, what amount of "slack," or of surplus cable, should be provided to meet the waste, in varying depths of water. 1. The possibility of laying out a cable straight along the bottom, in deep water, free from the action of currents. 2. What degree of tension would be required in the process? 3. What would be the effect, as regarded strain, under the varying circumstances of the depth of water, of the specific gravity of the cable, and of the velocity of the paying-out vessel? 4. What would be the relative velocities of the cable and of the paying-out vessel, requisite to reduce the strain, or tension to any given amount, and what would be the consequent waste of cable? 5. The effect of currents, and the consequent waste of cable. 6. How far it would be necessary, or safe, to check the velocity of paying out, when passing currents, so as to avoid, as far as possible, waste of cable? 7. Would it be safe, and if so, under what circumstances, to stop the paying-out, and to attempt to haul in the cable from great depths? 8. The effect of the pitching of the vessel in a heavy sea. 9. The principal desiderata in the paying-out apparatus. 10. The effect of floats, or resisters. 11. The best means for saving the cable, in case of fracture. 12. The best mechanical construction of a submarine cable. After investigating the laws of bodies, such as cables, sinking in a resisting medium, the Paper proceeded to show the great waste of cable attendant upon paying out free from tension at the ship. The form of the curve assumed by a descending cable was then examined, and the amount of tension at the paying-out vessel, requisite to lay the cable without slack along the bottom, estimated under various conditions. The effect of the friction of the water in decreasing this tension, and the result, as regarded the tension, of increasing the velocity of the cable beyond that of the ship, were then pointed out. It was shewn, that the decrease thus obtained was of small amount, unless the speed of the paying-out vessel was considerable, and that a decrease of tension should rather be sought in a diminution of the specific gravity of the cable. The tension at the ship in 2,000 fathoms water was stated to be about 35 cwt. for a cable similar to the Atlantic cable, but with a cable of the specific gravity of 1.5 it would not exceed 7¾ cwt. The effect of currents was then considered, and it was maintained that they did not bring any additional strain upon a cable, and involved only a small loss of length on first entering them. In a hypothetical case of a current extending to a depth of 200 fathoms, and running with a velocity of 1½ foot per second, at right angles to the ship's course, it was calculated that the extra length of cable due to the deflecting action of the current would not exceed 28 fathoms, the velocity of the ship being 6 feet per second. The effect of stopping the paying out was next treated of, and it was shown that it would be to bring a very heavy catenarian strain on the cable, depending upon the depth of water, and the velocity of the paying-out vessel. The amount of this strain for the Atlantic cable in a depth of 2,000 fathoms, and at a velocity of the paying-out vessel of 6 feet per second, was calculated at above seven tons. The question of hauling in the cable was then adverted to, and the conditions under which it might be safely attempted, were pointed out. After discussing, briefly, the effect of the pitching of the vessel upon the strain of the cable, the paying-out apparatus was referred to; and the importance of reducing its inertia, and of so constructing the brakes that they should act freely, was maintained. Two plans were then mentioned for saving the end of the cable in case of fracture, and tables were given, showing the velocity and direction taken by the end of the cable under such circumstances. The Authors then proceeded to offer some remarks upon the mechanical structure of the cable, and strongly advocated a light cable. The distinguishing feature of this system of construction was, that the whole of the metallic portion was placed in the centre, and was surrounded by the insulating material; whereas, in the Atlantic Cable, there was an outer sheathing of wire rope twisted spirally round the insulating medium. It was shown that whilst the absolute weights of the two cables were as 21½ to 10, their relative strengths were as 11 to 25, so that the light cable, weighing scarcely one-half of the heavy one, had nearly two and half times its relative strength. The effect of compression and tension on the two constructions was then referred to, and it was maintained, that in this respect also, the light cable possessed advantages over the other. In conclusion, the Authors, while disclaiming any intention to find fault, expressed their strong conviction, that though the Atlantic Cable was a step in the right direction, as compared with the heavier cables of former days, it yet fell far short, in mechanical structure and condition, of the light system recommended by Mr. Allan and others. The practicability of safely submerging the present Atlantic Cable was not denied, but it was strongly urged, that with a cable of its specific gravity, success would be greatly dependent upon the nature of the paying-out apparatus, and the sedulous attention of those in charge of the brakes. 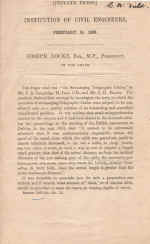 It was considered advisable to postpone the Discussion on this subject until the following Paper, which was announced to be taken at the next meeting, Tuesday, February 23rd, had been read, "On the Practical Operations connected with the Paying Out and Repairing of Submarine Telegraph Cables, by Mr. F. C. Webb, Assoc. Inst. C.E. INSTITUTION OF CIVIL ENGINEERS. - Tuesday, February 23rd, at 8 P.M., "On the Practical Operations connected with the Paying-Out and Repairing of Submarine Telegraph Cables," by Mr. F. C. Webb, Assoc. Inst. C.E.